Heavyweight legend Muhammad Ali had hoped to be in the UK today, to officially open the “I am the Greatest” exhibition honoring his life and career at The O2. But, as reported by The Mirror, the 74-year-old icon was told by doctors that he needed to build up his strength for the long flight from the U.S. 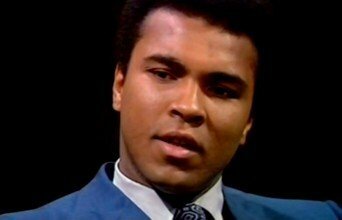 Reportedly, Ali, who has been bravely battling Parkinson’s since being diagnosed in 1984 (but many of Ali’s fans believe the great man was actually suffering from the disease a fair bit sooner than then; perhaps as early as the late 1970s, when he was of course still fighting at the highest level) will get his fitness levels up as high as is possible for a man who has Parkinson’s, and the plan is for “The Greatest” to then visit the UK, and the exhibition, in the summer. The exhibition, crammed with treasures from Ali’s boxing career, opens tomorrow (March 4th) and runs until the end of August. Ali’s wife Lonnie is here in the UK now, and she will open the exhibition tomorrow. One other thing Ali wants to do in what will certainly be his final visit to his “second home,” is meet the Queen at Buckingham Palace. During his life, Ali has met Presidents, heads of states and numerous other political giants and now, according to a close source who spoke with The Mirror, Ali wants to meet Queen Elizabeth. Ali remains the most inspirational figure in boxing history. Currently there is a petition to get Ali Knighted, with over 20,000 having signed; including sporting figures and big names from the world of politics. It will be interesting to see if the Queen can find time in her busy schedule to accommodate Ali when he arrives in the UK. Perhaps the Queen will have a most prestigious honour to bestow on the greatest heavyweight champion in boxing history when the two do meet. Now loved, appreciated, respected and cherished by just about everyone on the planet, Ali might get to meet the Queen for real this year. Ali will not be here forever and we must celebrate and enjoy him while he is still with us. Never in boxing will there ever be another man like him.